We are working hard developing new features and overall improvements for OpenNebula 4.0. Before the new Sunstone eye-candy is revealed and steals all the attention, we wanted to share some of the other features, those small pieces that won’t wow anyone, but combined together make OpenNebula the best option when it comes to integration capabilities. In this post I will focus on the Scheduler related features. $ onevm shutdown 0 --schedule "05/25 17:45"
$ onevm cancel 0 --schedule "05/25 18:00"
These actions can be edited or deleted updating the VM template (another new feature that you will see in 4.0). SCHED_REQUIREMENTS = "CLUSTER = production"
SCHED_REQUIREMENTS = "QOS = GOLD"
SCHED_REQUIREMENTS = "QOS != GOLD & HYPERVISOR = kvm"
SCHED_MESSAGE="Wed Feb 20 11:43:55 2013 : No hosts enabled to run VMs"
SCHED_MESSAGE="Wed Feb 20 11:52:11 2013 : No host meets the SCHED_REQUIREMENTS expression"
SCHED_REQUIREMENTS="FREE_CPU > 100 & FREE_CPU < 50"
Now that we have the IDs, we can update one of the VM’s scheduler requirements. The scheduler will deploy first VM 2, and in the following cycle VM 3 in the same Host. This, of course, has some limitations because the scheduler will treat each VM individually, instead of as a group. If you need more advanced VM group management, give a try to the AppFlow component. As always, we welcome any feedback. In fact, most of these changes are requests made by the community, I invite you to join our mailing lists and our development portal if you haven’t yet. OpenNebula 4.0 is around the corner and we wanted to give you a sneak peek on one of the upcoming new features: Ceph integration. and run the virtual machine!. This driver uses libvirt to handle RBD devices (Ceph block devices) so simplifying a lot the Datatores and Transfer Manager drivers. We would like to thank Grzegorz Kocur, Bill Campbell and Vladislav Gorbunov for their community contributions to develop this driver. 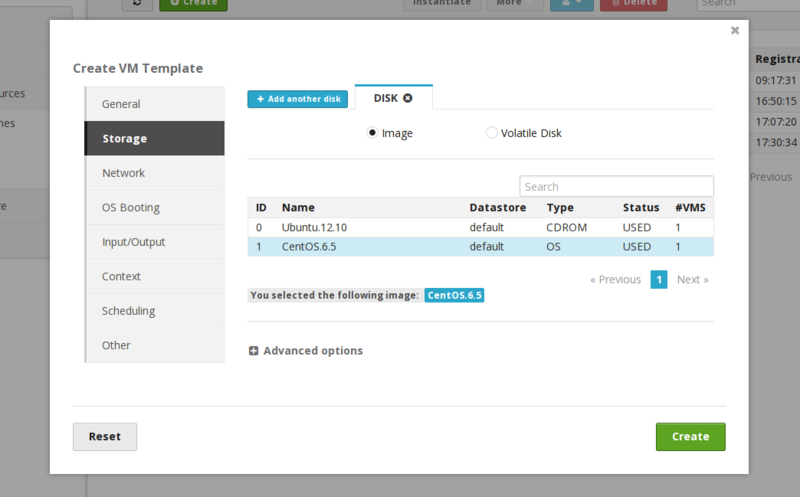 More about this in the OpenNebula Ceph Datastore documentation. This new feature is ready to be tested in the ‘master’ branch. Give it a try if you want! This year OpenNebula is actively participating in the world’s leading high-tech event. C12G Labs will have an Exhibition Stand in the Open Source Park (Hall 6, Stand F16, 330), which we would be sharing with Netways, an IT solution provider quite active in enterprise-grade open-source tools. We invite you to visit us and see the innovations that will come with OpenNebula 4.0. Catch a glimpse of the revamped Sunstone Web interface. A lot of effort is being put in, ensuring a complete facelift of the interface which will enrich the experience of managing and using an OpenNebula cloud. Come and check it out for yourselves! We will happy to meet up in Hanover and discuss your infrastructure needs. If you are willing to enter the cloud path, we can pave the way for you to ensure a easy and smooth transition from your traditional data center into a cloudy one. Let us know if you want to arrange a meeting, or just drop by the exhibition stand. 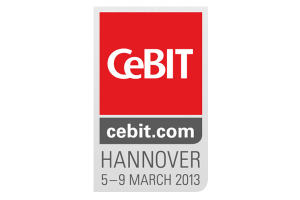 See you all at CeBIT 2013! After receiving several requests from our users to sponsor some particular features, the OpenNebula project is happy to announce the creation of a software development program where organizations will be able to fund the development of new features. When we define the roadmap for a new OpeNebula release we listen to all users, trying to prioritise the features demanded by the organisations supporting the open-source project with a commercial subscription. However we cannot guarantee a time frame for their development. The Fund a Feature Program can be used to implement within a given time frame new functionality or enhancements in the code, new or enhanced drivers, or new integrations with existing management, billing and other OAM&P systems. The development of new features occur in the public repository of OpenNebula, and the new code undergoes the testing, continuous integration, and QA processes of OpenNebula before its incorporation into the main OpenNebula distribution. The new code and documentation will publicly acknowledge your funding support, and the OpenNebula web site will include your name on the list of featured contributors. Over the last five years, since the release of the first open-source version of OpenNebula in March 2008, we have been involved in many presentations, discussions and meetings where people wanted to know how OpenNebula compares with the rest of open-source Cloud Management Platforms (CMPs), mostly with Eucalyptus and OpenStack. The most common understanding is that all CMPs are competing in the same market, trying to fill the same gap. Consequently, people jump to the wrong conclusion that after years of a fierce competition, there will only be one winner, a single open-source CMP in the market. However, as discussed by Joe Brockmeier in his post “It’s Not Highlander, There Can Be More Than One Open Source Cloud”, there is room in the market for several open-source CMPs that, addressing different cloud niches, will fit together into a broad open cloud ecosystem. We have prepared this article to briefly describe our experience about the different types of cloud models, and our view about how the main open-source CMPs are targeting their needs. Do not expect a table comparing side-by-side the size of the communities, technical features of the different tools, or the management structure of the projects. We have tried to focus only on their general approaches, on their overall position in the cloud market, and, of course we have tried to be as neutral as possible. Datacenter Virtualization: On one side, there are businesses that understand cloud as an extension of virtualization in the datacenter; hence looking for a vCloud-like infrastructure automation tool to orchestrate and simplify the management of the virtualized resources. Infrastructure Provision: On the other side, there are businesses that understand cloud as an AWS-like cloud on-premise; hence looking for a provisioning tool to supply virtualized resources on-demand. Yes, we know, we said that we wanted to focus only on open-source CMPs. However we have intentionally used two of the principal cloud “products”, VMware vCloud and AWS, a proprietary CMP and a cloud service, because they are the most well known implementations of both models. We will go even a step ahead and claim that most of the users in the first cloud model explicitly express their willingness to find an open alternative to vCloud because it is too expensive, because they want to avoid vendor lock-in, or because it cannot be adapted to meet their needs. Equally, users in the second cloud model explicitly mention Amazon as the type of cloud they want to build internally. The following table describes the main characteristics of both types of clouds. This is not an exhaustive list, I’m just putting it here to illustrate some of the differences between both philosophies. This classification of existing cloud models is not new. 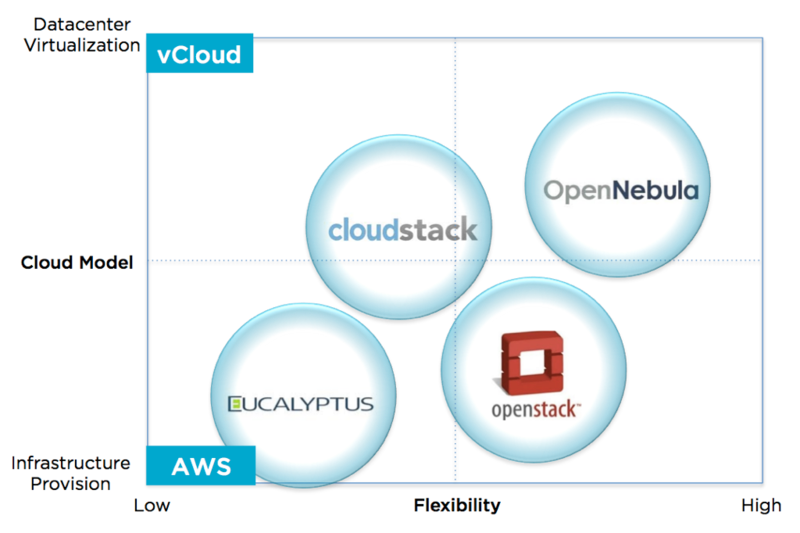 The “Datacenter Virtualization” and “Infrastructure Provider” cloud models have received different names by different authors: “Enterprise Cloud” and “Next Generation Cloud” by many analysts, “Cloud-in” and “Cloud-out” by Lydia Leong, “Enterprise Cloud “and “Open Cloud” by Randy Bias, “Enterprise Cloud” and “Private Cloud” by Simon Wardley, “Private Cloud” and “Public Cloud” by Matt Asay, and “Policy-based Clouds” and “Design for fail Clouds” by Massimo Re Ferrè, who also categorized these models as “Design Infrastructure to support Applications” versus “Design Applications that leverage Infrastructures”. Existing open-source CMPs can be placed somewhere in between both models. We have created a chart, the CMP Quadrant, aiming to aid corporations to better understand the present and future landscape of the cloud market. One of the dimensions is the “Cloud Model” and the second one represents “Flexibility” in terms of the capabilities of the product to adapt to datacenter services and to be customized to provide a differentiated cloud service. This dimension captures the grade of adaptability of the product, and goes from low to high. Finally, we have placed in the chart the main open-source players in the cloud ecosystem: Eucalyptus, CloudStack, OpenStack and OpenNebula… or at least those tools that are commonly compared to OpenNebula by our users and customers. We are not suggesting that one position (read “tool”) in the chart is better than other, only that some of the CMPs are so different that cannot be compared, they are on completely different tracks (read “zones in the Quadrant”). The chart does not represent absolute values, the relevant information is in the relative positions of the CMPs with respect to their “Cloud Model” and “Flexibility”. The openness of the software is orthogonal to this chart, you can also use it to compare proprietary CMPs. Any CMP can be used to build either public or private clouds, all of the CMPs in the Quadrant implement cloud APIs. And last, but not least, this map is not static, the different CMPs will move right, left, up or down over time, but they cannot be simultaneously in different places. There is not a single perfect solution for every possible scenario. Comparing vCloud to AWS or comparing vCloud to OpenStack is like comparing apples to oranges as it has been clearly expressed by Massimo Re Ferrè and Boris Renski respectively. Both are fruits but with very different flavor. That being said, it is clear that since all the tools enable infrastructure cloud computing, there is always some overlap in the features that they provide. This overlap tends to be larger for those tools that are closer on the “Cloud Model” axis. There are fundamental differences in philosophy and target market between OpenNebula and Eucalyptus They are in opposite zones of the Quadrant servicing different needs and implementing completely different philosophies. I would say that they represent the open-source incarnations closer to vCloud and AWS respectively. In the same way many companies compare OpenNebula with OpenStack because both represent flexible solutions that can be adapted to their needs, but wrongly think that both enable the same type of cloud. It is also clear that Eucalyptus and OpenStack meet the same need and so compete for the same type of cloud. In OpenNebula, we do not think that one cloud model will dominate over the other. They may converge at the very long term, but not before 10 years. Consequently, and because a single CMP can not be all things to all people, we will see an open-source cloud space with several offerings focused on different environments and/or industries. This will be the natural evolution, the same happened in other markets. The four open-source CMPs will coexist and, in some cases, work together in a broad open cloud ecosystem. Some corporations are mixing an Enterprise Cloud with an in-house Cloud Service. They are implementing a cloudbursting architecture where an OpenNebula enterprise cloud bursts to an OpenStack- or Eucalyptus-based cloud when the demand for computing capacity spikes. Other corporations are using components from different projects to build their cloud. The integration capabilities of OpenNebula are allowing its integration with OpenStack Swift or OpenStack Quantum for object/block store and networking management respectively in the data center. We are sure that in the short term we will see some of the open-source CMPs working together, while at the same time finding ways to differentiate themselves in their own cloud markets. OpenNebula 4.0 is getting prepared, the team is finishing the new shiny features and the beta release is just a few weeks away. Here’s our monthly newsletter with the main news from the last month, including what you can expect in the coming months. A very active month for OpenNebula, with several big news. A major change has occurred in the OpenNebula release process, with C12G announcing that every OpenNebula maintenance release and service pack will be made publicly available at the community site. From release 3.8 onwards, the OpenNebula community will enjoy the benefits of the OpenNebulaPro distribution including the C12G’s Quality Assurance processes. Which is really good news! The OpenNebula distribution will benefit from a more up to date, quality software. 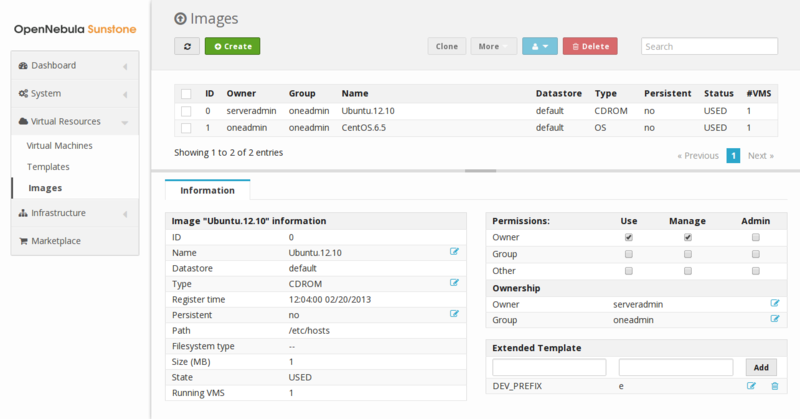 In a nutshell, the upcoming OpenNebula 4.0 will come with a revamped Sunstone interface (stay tuned for this! screenshots may leak shortly in your favorite cloud management platform twitter account and in this blog), core enhancement with audit trails, additions to virtual machine lifecycles (like the “hold” state), the ability to create disk snapshots, which comes in very handy for the day to day service management, as well as support for RBD block devices. A groundbreaking milestone has been reached with the open-source release of the OpenNebulaApps, a suite of tools for users and administrators of OpenNebula clouds to simplify and optimize multi-tiered application management. The new software has been released under Apache license and will be incorporated into the main distribution of OpenNebula, bringing state-of-the art service management (among other nice features) to the OpenNebula community. There have been a number of community contributions to OpenNebula during this last month. A very valuable contribution was made by Nicolas Agius as a new ecosystem component, the Clustered Xen Manager (CXM) drivers for OpenNebula. These TM and VMM drivers allow the use of cLVM datastores on a pool of XEN hypervisors. It also brings high-availability and load-balancing to the hosted VM using the CXM. Another outstanding contribution by Ricardo Duarte is the econe metadata server, which enables VM contextualization for OpenNebula clouds the same way it is done in the Amazon EC2 environment. 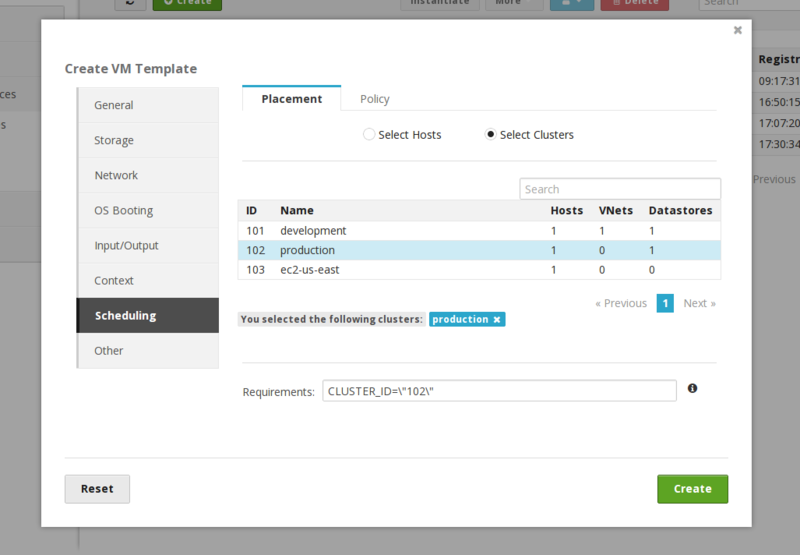 Moreover, support for OpenNebula in rexify (a popular server configuration management tool) has been added, enabling virtual machine deployment and contextualization using rexify in OpenNebula clouds. We would like to thank the numerous people that provided feedback, either through the development portal or the user mailing list, with bug reporting, patches for bug fixing and the intense testing. OpenNebula community, healthy as ever! A relevant post has been written in GigaOM about the open-source release of the OpenNebula Apps components with Apache license.